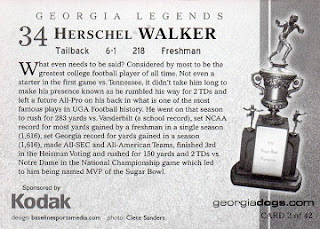 This card is part of a 42 card set issued in 2005, to commemorate the 25th anniversary of the 1980 Georgia Bulldogs national championship team. 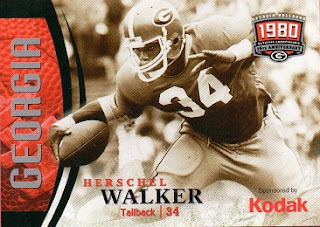 Herschel Walker was the star player on this team, which defeated Notre Dame in the 1981 Sugar Bowl, to claim the title as the top team in college football. The set was sponsored by Kodak. I'm very pleased to add it to the Herschel Hoard.